Since 2016, Iv decide to continue my study in China. Most of all because of its development and technology, well known as one of the populous country in the world. Beside, this country has provide so many interesting culture and heritage to be observed. Before I arrived here, I have promised myself to sketch every site that I visit no matter what I see or Experience. As 2016, Beijing, the city that I stay, the place where I mostly study, gives so many chance until now for me to discover every single of its urban spaces. Namely the Urban Place which is modern, Traditional cultural space, and even natural place or say it as gardens. Here, you can find it all. Beside this marvelous city, in the end of the year, I got a chance to visit Qingdao, a city near the beaches. I sketched the Red Landmark of this city also. A landmark which shows the symbols of the movements for the people here. In the beginning of the year 2017, I was curious of the Urban Sketching Community of Beijing. 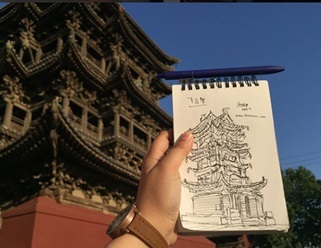 So I decide to join them sketchwalking in Lama Temple, Yonghegong. My first sketch blending was done with the other sketcher living in Beijing. Then, the next future sketchwalking adventure encourage me to do some sketching also to some of spaces around China. So, as in one year I discovered mostly places in Beijing including all the landmarks. As I also learn some Chinese language from them as they stop by to ask what am I excactly doing. The Interaction between the city, space, and art happens as I try to sketch some of places here. The next city I have discovered is Shandong, as this city gives me opportunity to join the Asean-China Youth Forum. It’s a quite peaceful city and that time I just got to sketch the University. 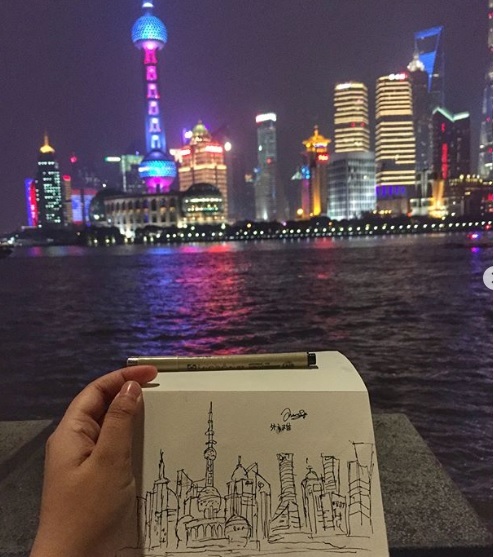 Another chance was when I get to sketch Shanghai, another urban city which gives me many interesting spots including the famous Bund in the middle of the city and along the river. Sketching the city of Daixin as it was in the event of International Cycling Event 2018, creates another challenges as this city is so silent and hot. But yet, every city and village that I experience deserve to be sketched. Tianjin gives me another artsy style of the city. It has thousands of artistic views and it glows in the night. A place which is worth it to visit again. Don’t forget also Gubei Water town, the Cave, and other surrounding cities beside Beijing. I am very sure they are all artsy to be sketched. I never imagine that my research will be related to one of an ancient timber structure protected by the government. It is full of complexity. Known as one of the Pagoda which is preserved in Wanrong County. Beside, my research site which is located in Shanxi Province gives me another inspiration to sketch one of an important site to be visited. The ancient Feiyun Building where I met so many obstacles in finishing my research here. Also I found some enjoyments. A third floor building with timber as its wooden material. As till know Im still struggling and dealing with this problem of research but I really enjoy every single site that I visit there. It will be an interesting life experience that I gain beside sketching China.